Last year, flush with the success of a year without changing employment more than once, I bought one of the most geeky items I have ever bought. On spec, I ordered a wi-fi enabled kettle. This isn’t as crazy as it seems. Being a tea snob and evolving coffee appreciator, I’d like to be able to specify what temperature to heat the water in my kettle to, and once you want to do that the cost of buying a kettle jumps north quite significantly, to the point where getting a wi-fi enabled one is a jump of a few tens of pounds, rather than tripling the price. It cost me a hundred pounds, and now is going for around that, give or take twenty quid. In the normal way of things, it’s a kettle. You fill it with water, push the button, wait for boil. You can push another button to change the temperature. It boils quite fast, the water is the right temperature, so far, so kettle. It comes with an app – free from the App Store or Google Play – which is how you can interact with it on your phone. 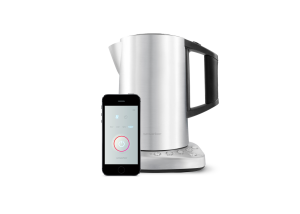 By default it launches its own iKettle wifi network, and the app guides you though teaching the kettle how to connect to yours instead. This done, the app presents you with the same options as the kettle does, but from the comfort of your own bed. Press button to boil water. Press another button to keep the kettle at that temperature afterwards. It’s even got a built-in countdown clock for your brewing time. The tech’s not very efficient. While mDNS would have been a great idea, instead it scans the recognised IP range and fires a HELLOKETTLE at everything listening on the right port. This means connecting to it can be quite slow the first time. Someone’s worked out the right things to send enough to put together a python script to control it, and Loxone’s home automation has a module for it too. I’ve not started working on a Pebble app for it, but it’s tempting. It’s not going to fill the kettle for you, and it’s not going to pour the water into the kettle for you. I’ve had a couple of finicky problems with the wifi connection, usually fixed by rebooting the kettle (*sigh*), and one router it point-blank refused to talk to ever. The build quality’s on the high side of reasonable, though the spring in the lid’s stretching out after a year, so it doesn’t seal at the top anymore. I’ve had one base-station die, but once I got through to tech support they sent a new one over by courier. Local network only. 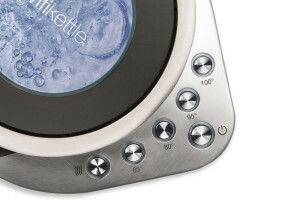 You cannot turn on your kettle over the internet. It’ll boil at a specific time, so you can wake up with the kettle already boiling. The app has the option to learn the GPS coordinates of home, so as you get home it’ll greet you with the option to put the kettle on. The “Keep Warm” function will keep the water at the specified temperature until you get around to doing something about it. It’ll tell you when it’s boiling dry. You’ll get a phone notification when the kettle’s boiled. 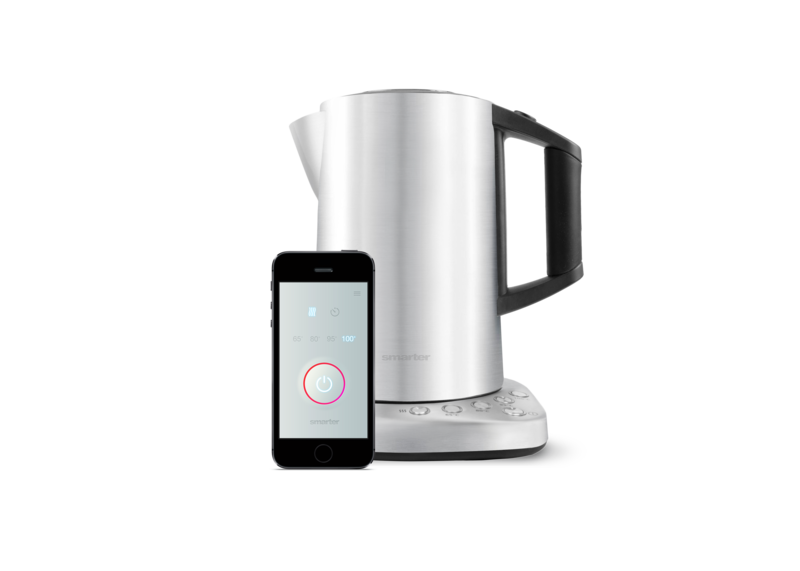 The same company – and the same app – are working on a coffee maker too. Local network only. There is no method for anyone to be able to hack your kettle. All in all, I don’t regret buying it. It’s not a great saver of time, but the temperature control and the keep-warm are definitely advantages, and being able to boil the kettle without getting out of bed, or before I get in through the door, are low level improvements on my day.